It is one thing to be critical of presidential actions, it is another to be critical of a president just because. I didn’t miss a word there, there is often no justification beyond “Trump, therefore bad!” This blows my mind for two reasons. First, there are plenty of legitimate reasons to bash Trump. Second, how can you form an argument with no tangible justification? CNN’s Jen Psaki helps make this case with her latest piece. To be honest, she brings up some valid points. The problem is she blatantly lies and misleads for political points, which has become par for the course in the age of Trump. She opens, “every helicopter supporting Trump’s visit to Hurricane Sandy is not picking survivors off rooftops.” If she would have left it there, that would have been perfect. It is a fair point and one to be objectively discussed. But, as is now the norm, she just couldn’t resist the political posturing and perpetuating the “us vs them” mentality. During my eight years in and out of the Obama administration, the general rule of thumb was that before a high level visit, the team on the ground should be moving out of the phase of active search and rescue and into the phase of damage assessment. Again, I like this rule and many Americans would support it. The main focus should be search and rescue with everything else taking a backseat. The problem is that she clearly implies that Trump is doing something Obama wouldn’t have done. Except Obama did the same thing. On October 29th, 2012, Hurricane Sandy made landfall in the US near Atlantic City. 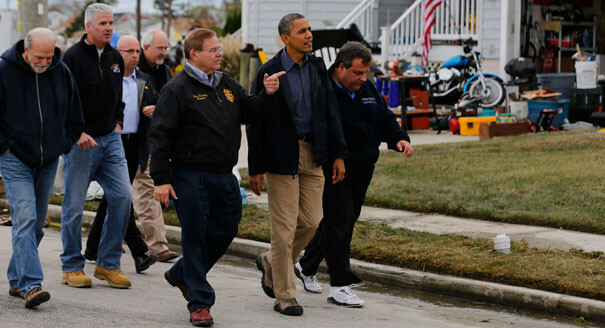 On October 31st, 2012, just two days after, Barack Obama was surveilling the damage with Chris Christie. If we are going to question if the president should visit sooner or later, then we need to do so on principle, not on party. It is sad how predictable the media and their stooges have become. Whenever there is a serious event, the politicians argue about who wore the disaster better. Rather than deciding what the appropriate response would be, they point to the other side and scream “you’re doing it wrong!” Unfortunately, they are screaming into the mirror. When there is a serious event, the politicians argue about who wore the disaster better. Meanwhile, the American people and first responders on the ground will continue to save lives and make an impact. It’s incredible what the citizens can do when left to their own ingenuity and kindness. Our politicians and their lapdogs should take notes and learn from their fellow citizens.